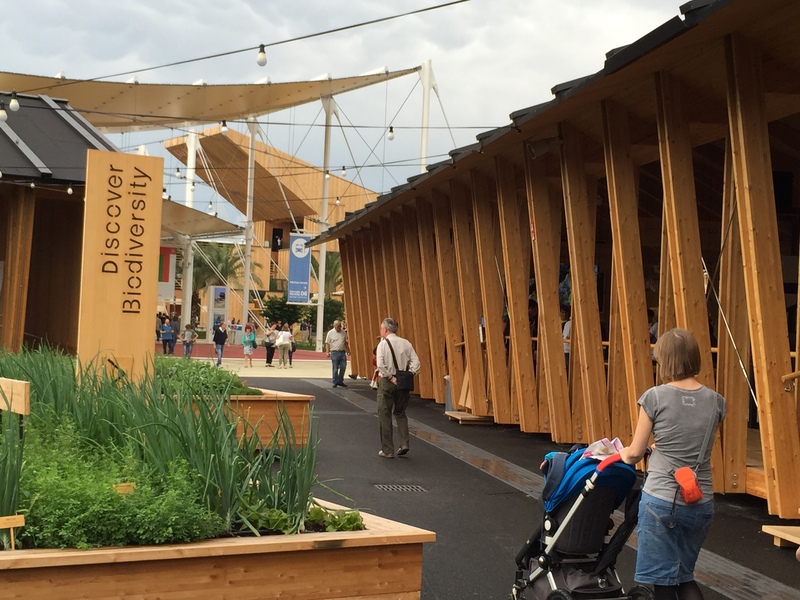 In our first post we discussed the overall design of Expo 2015 and the pavilions we enjoyed on our first day there. There are 96 pavilions in total: national, corporate and non-governmental institutions, of which we visited perhaps a third. What follows is our analysis of this portion of pavilions. We choose to attend this year’s Expo because it is an event in which architecture overtly responds to the subject of “energy for life.” In 2008, we spearheaded the involvement of over 30 firms in designing Slow Food Nation in San Francisco; as a result, we were interested to see this challenge taken to the world sage. First impressions are crucial. We passed every pavilion on the site, but with limited time had to choose only a few to visit. Pavilions have to attract: this was often achieved with a high degree of transparency, particularly at the ground plane. In Milan’s benign climate, this transparency generally meant completely open air. Closed boxes generally had the effect of pushing visitors away, and consequently we rarely went in. The clear architectural move – generally a signature idea, with richness – also provided strong appeal. For the purpose of trying to understand what we saw, I break the pavilions into three categories: those which are first and foremost artistic statements, those which are powerful architectural statements, and those which succeed on a didactic level. Each group clearly has attributes of the others, but one dominant emphasis. Three pavilions stand out for their artistic qualities: Bahrain, Austria, and the United Kingdom. I wrote about the Bahrain pavilion in my first post; I’ll only note here that Studio Anne Holtrop and landscape architect Anouk Vogel have created a singular piece in which notions of inside and outside are constantly shifting, to allow the food-bearing plants of this desert kingdom to become works of art within a larger piece of art. “Breathe Austria” explores the power of the forest to provide oxygen, cooling, and food. One enters under the pavilion and up a ramp, through a piece of Austrian forest that is both enclosed by the pavilion yet spills out below it. Walking up one is greeted by the word “BREATHE,” which breaks apart into a “B,” an “R,” and an “HE” – ultimately revealing “EAT” at the end of the path, a celebration of the pavilion’s sole function: the tasting bar. Next one circulates the forest on a walkway along the pavilion walls, here stained a dark brown in contrast to the grey concrete exterior. The pavilion claims to be an open source prototype showing how this forest in the pavilion can (with the aid of fans) cool a building about 5°C from external temperatures and through oxygen production create a stimulating environment. Viewfinders allow once to “investigate the forest,” but the most powerful part of the pavilion is the presence of the forest captured in a box. “Hive,” The United Kingdom pavilion, is first approached through a landscaped forecourt with an entry portal of steel with the lettering both laser cut and a flag embossed in the metal. This vocabulary of steel panel is used throughout the pavilion but the signage is most successful here because of the layering and the backlighting. Further on the signage – which explains how the UK is like a hive – essentially disappears. After the forecourt one proceeds through wood walls into a meadow in raised planters that brings the flowers up into one’s face as if one is a bee. 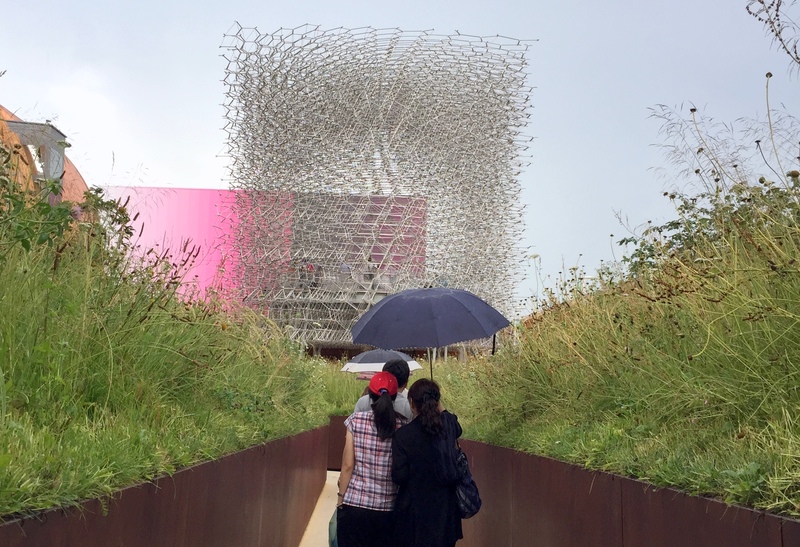 A steep set of stairs takes visitors up to the stainless steel “hive,” a true piece of art. Here the food counter seems almost out of place; the memorable moment is the trip through the meadow to the Hive. All three pavilions that I categorize as “art” have very strong landscape components that are central to their conception. The second category of pavilion all use strong architectural concepts to provide compelling environments to show off their country and its interpretations of Expo’s themes. Brazil’s pavilion (discussed in my earlier post) fits into this category. The long steel armature that runs end to end on the site, with the walkable net rising up through it, creates a strong tectonic statement in which the rigidity of steel is contrasted with the pliability of rope. The architectural crop paintings below provide a landscape – but here it is a context. The interior portions of the pavilion are elegant but clearly subordinate to the environment created by the steel armature. I include the Chilean pavilion here for its formal strength. It is a great 3-dimensional wood truss raised off the ground on mighty steel supports. While we were not able to ascend into the pavilion, we did experience its dynamic ground level that begins with a retail shop, progresses to a restaurant, and ends in a dance club – all open air, all in wood tones or black, which brilliantly showed off the dynamics of the crowd. The visitors become the exhibit here in a particularly Latin way. The pavilion benefits from being next to the Austrian pavilion which provides a perfect subtle foil. 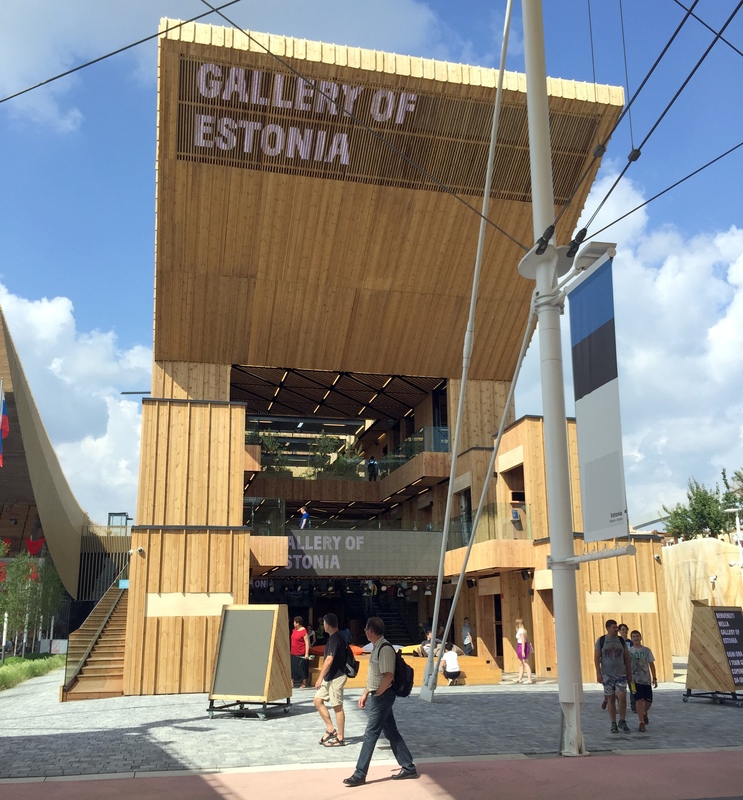 Estonia’s pavilion is a three-level structure that is split open in the middle and has dynamic sectional quality that reminds me of the work Paul Rudolph. Like Rudolph’s work, the spaces are in tension with the building blocks and vertical circulation is pushed to the side in favor of the spaces. The blocks here are all of wood and each block becomes the focus of a different product or place. Between the blocks are pairs of wood swings which give the pavilion a lighthearted feel. A forest occupies the third floor terrace. The Estonian pavilion seems less about specific themes of the exhibition, but creates a strong sense of the country it represents. Didactic pavilions communicate a specific theme or set of themes above all else. Each uses ideas drawn from art and powerful architecture, but in the end completely in the service of communicating a position. Pavilion Zero’s name is a statement of its message: zero hunger. I wrote on this pavilion in my first blog post – about the three-story interior classical wood façade, a symbolic library of thoughts and ideas, seeds for a better future stored in its drawers. The power of this structure in its dark space is almost religious, and the transformation experienced walking through the façade and into a giant projection screen takes visitors from the 16th century into the 21st. The entire pavilion seeks to show us where we have come from so we can address where we want go: zero hunger. One’s first impression of the United Arab Emirates’ Pavilion is that of a landscape form – a box canyon in the desert. 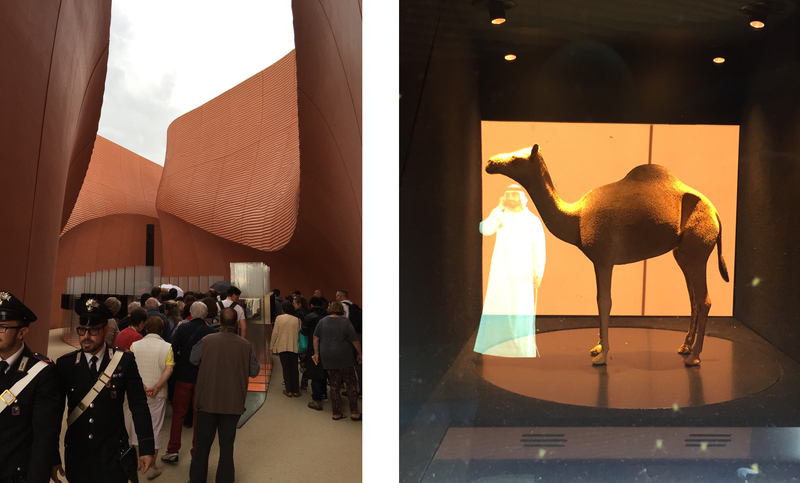 Visitors ascend through the canyon admiring small jewel box displays that celebrate the UAE’s history through holograms. After winding through, one is confronted by a large screen on which short clips educate viewers with facts about the federation. Just when you thought you were done, doors swing open and you are ushered into a circular theater for a ten-minute movie – an amazing production that tells of UAE’s evolution over the last 50 years through the eyes of an adolescent back in time. The date palm becomes a symbol of enduring strength, while sand storms come to life in a sense-surrounding experience where wind gusts into the room. Yet another room is revealed beyond, and the young heroine takes the stage in front of you. This masterfully choreographed experience allows many, many visitors to be cycled through. You “help” the young heroine – who wears Armani Junior – to complete her school report on a tablet, learning how UAE gets much of its water through desalinization provided by fuel created through algae growth. A final theater informs viewers about the UAE-hosted Expo 2020, while another hall shows off various business opportunities. This pavilion is without doubt the most tightly produced experience utilizing architecture and technology. The Vanke Real Estate Group from China commissioned Daniel Libeskind to design its pavilion. It is a sculptural shell for a video presentation amidst a forest of a bamboo that explores the experience of dislocation from rural to urban China– both in terms of opportunities and challenges. The message is what one would anticipate, one of hope. Here a sculptural piece of architecture becomes the draw to see the highly produced environment inside. At Emirates the experience does not have this duality – it is all of one piece. The US pavilion hovers between the second and third group. It is a strong piece of architecture, its steel form like a powerful battleship, its vertical farm along the left flank both a piece of engineering and art. The main floor feels a bit overwhelmed by the many displays at odds with the architecture, but the simple majesty of the space reads through. The didactic quality of the pavilion manifests itself in a group of seven small movies shown on sculptural screens. The idea is powerful as are the themes, although the multifaceted screens, like the displays on the main level, seem a bit busy for my taste. Tucked off to the side of the pavilion is an American food truck section which sadly falls flat. Instead of sourcing from America, red/white/blue European trucks sell hot dogs and hamburgers – a better solution would have an Off the Grid experience from San Francisco, rich with dynamic cross-cultural inventiveness. Meanwhile, the US is also running a pop-up restaurant in downtown Milan that highlights a rotation of famous American chefs. One has to appreciate the breath of the ideas being communicated, even if they do not always come off. In the first blog post I discussed the power of Herzog’s Slow Food pavilions, three of which form a triangular plaza around a raised edible garden. This installation belongs in all three categories. The simplicity of the pavilions and garden are an ode to the simplicity and power of biodiversity – the planet as we have been given it. The architectural power of the pavilions is akin to the primitive hut that theorists see as the root of all architecture. The didactic quality of the complex is in its very essence: in the way that it embodies each of us as we move through these buildings and the space that they create. It is in the details of the architecture and the details of how the gardens are planted. It is in the power of the ideas.